Welcome to 4U Outfitters. Your premier Wyoming big game outfitter. 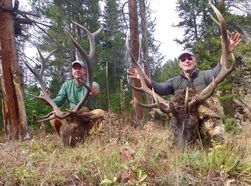 Based in beautiful Moran, Wyoming, 4U Oufitter's hunting areas border more of the Grand Teton National Park than other outfitters. We offer a wide range of hunting opportunities for various game animals to make your hunt of a lifetime a reality. When you book with 4U, you are coming to hunt with owners and guides with decades of experience. Not to mention our outfitter on record, Jesse Rodenbough, is the past president of the Wyoming Outfitters and Guides Association as well as Jackson Hole Outfitters and Guides where he still sits on the board. Visit our HUNTS page for more information. We also offer summer PACK TRIPS as well.